Publication: Peregrinus in Jerusalem (Fremdling zu Jerusalem), Myller, A. M., Vienna & Nurnberg. Engraver: J Hiller, A J Mansfelt, J J Ditzler, J F Fischer and others. Condition: AAA, fold as given. A rare engraving of the Seraglio. 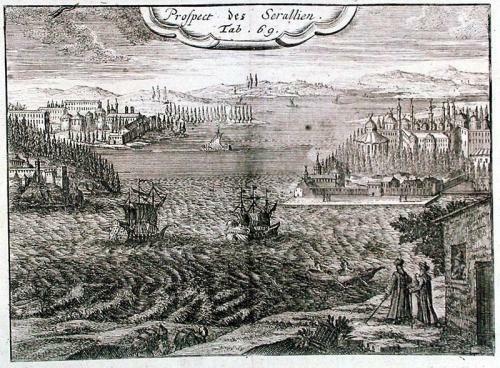 The headland on which Topkapi Palace stands is known as Sarayburnu (Seraglio Point). Sarayburnu lies at the mouth of Bosphorus overlooking both this strait, the Golden Horn and the Marmara Sea. The palace built here by the Ottomans was for 400 years the administrative centre of the Empire as well as the private home of the Sultan. From a book by A M Myller recounting his travels from 1725 to 1727. Myller journeyed from Rome to Jerusalem then on to Troy, Gallipoli and Constantinople. From Constantinople he travelled to Egypt and then to Syria. Finally from Syria he travelled to Malta and back to Rome.